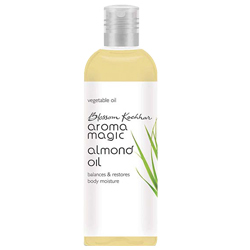 Buy Aroma Magic Almond Oil Relief from itching, inflammation & muscle pain, preventing signs of ageing. A vegetable oil extracted from almond seeds. When combined with essential oil, at best in massages. Help in maintaing the moisture levels of your skin can absorbed quickly without blocking your pores. For Extremely dry and sensitive skin, serve as an effective balm providing relief from itching, inflammation and muscle pain. The fusion of oleic and linoleic fatty acids help in reversing and preventing signs of ageing. Nourish your skin and make you look fresh and radiant.